Wagner’s first great love duet opens with introspection, as the Dutchman and Senta – in turn, then together – meditate on their feelings. He yearns for salvation through Senta’s love, while she is stunned by her powerful attraction to the stranger and longs to help him. In an extended dialogue the Dutchman questions Senta with growing intensity as to whether she will accept him as her husband. Senta’s serene determination reassures him and the couple – their voices first overlapping then uniting in excitement – eagerly await their union in the duet’s jubilant conclusion. Dido and Aeneas finally admit their love in this exquisite duet, one of the opera's few episodes of calm. They bask in the beauty of the night and their union, while lilting 6/8 rhythms and delicate orchestral scoring create an atmosphere of sensual tranquility. The music moves between an increasingly ornamented refrain and solo sections, which use text inspired by the love scene that opens Act V of Shakespeare’s The Merchant of Venice. The tenderness of this duet makes the lovers’ later tragedy all the more heartrending. This is one of opera’s most famous love duets – and, at more than twenty minutes, one of the longest! Tristan and Isolde rapturously hail their ‘night of love’ to an exquisite melody drawn from ‘Träume’ ('Dreams') of Wagner’s Wesendonck Lieder. The voice of Brangäne – Isolde's maid – is heard, warning the lovers to take care, and Tristan sings of his longing to ‘leave the world of day’. Finally he anticipates a joyful union with Isolde in death, introducing the melody that will become Isolde’s ‘Liebestod’. Isolde ecstatically echoes him, and the lovers unite in imagining their escape to a ‘realm of ecstatic dreams’. The opening introduction for muted divisi cellos perfectly sets the tone for Otello and Desdemona’s intimate reflections on their love, in one of Verdi’s rare depictions of a happy couple (if only temporarily). Otello is the more emotionally volatile – his music shifts from noble dignity to fierce passion and ecstatic tenderness. By contrast Desdemona’s lyrical music is consistently serene. Otello declares that joy has taken his breath away and we hear the ‘kiss motif’, which will return to devastating effect in Act IV. 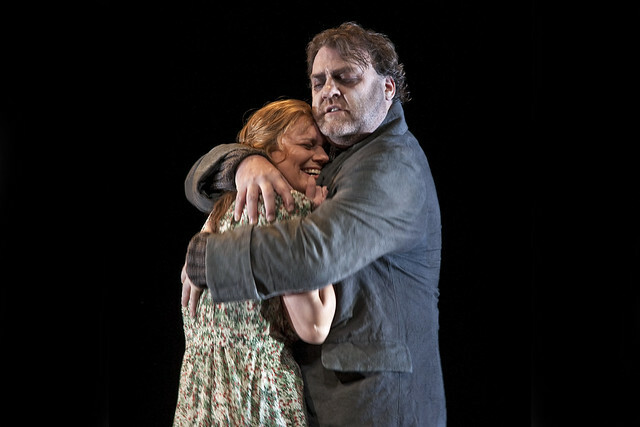 The couple’s voices unite in a soaring phrase accompanied by shimmering harp arpeggios as Otello leads Desdemona inside. This duet of love at (almost) first sight opens with shimmering strings and warm woodwind, horn and harp chords, as Rodolfo passionately praises Mimì’s beauty. The music becomes increasingly intense as Mimì’s voice joins her lover’s in a reprise of the melody from Rodolfo’s earlier ‘Che gelida manina’. It then delicately subsides into a gentle conversational passage as the couple consider where to spend the evening. As they leave, we hear luminously scored fragments of ‘Che gelida manina’, over which the lovers’ voices soar rapturously in an exquisitely simple avowal of love. Which operatic love duets sweep you off your feet? I was enthralled by Terfel’s Dutchman’s duet with Senta. The quiet intense beginning - and their interchange which was so intense - both vocally and acting. Bryn Terfel is a marvel - I love him so much! The end of L'Elixir d'Admire. Those violins when Nemorino realises he is loved - gets me every time! Super, thank you. I would add, "Bess, you is my woman now".